The thicker PELCO Image Tabs is a stiff 260µm (10mil) thick smooth conductive tab. Though not as conductive or sticky as the current 5mil PELCO Tabs, PELCO Image Tabs are suitable as a photographic background and are repositionable. This tab is also suitable for Jet Scan applications where the tab must be removed and archived. The PELCO Image Tab's surface is less prone to bubbling and cracking when metal coated under vacuum and thus better than the 125µm (5mil) PELCO Tab as a photographic background for small particles like pollen and insect parts. 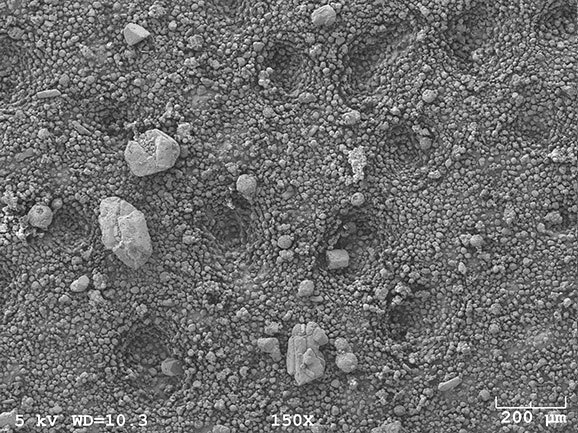 Smooth surface superior to traditional woven carbon tape for SEM and EDS analysis of small fibers and powders. Ideal for automated analysis of particles. 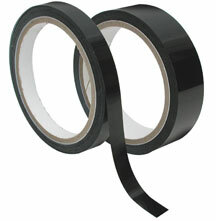 Aluminum Backed Carbon Tape also available. Both sides of the 200µm thick conductive polycarbonate base have 30µm thick conductive adhesive. Total thickness is 260µm. Same material as the PELCO Image Tabs™. Protection for handling, storage and shipping is provided on one side by the 25µm thick, transparent liner and on the other side by the 40µm thick, white liner. The conductive adhesive is a carbonfilled acrylic adhesive, free of solvents. It can be removed from the specimen mount with ethyl acetate, ethanol, isopropanol or alcohols. Temperature maximum is 60°C (140°F). 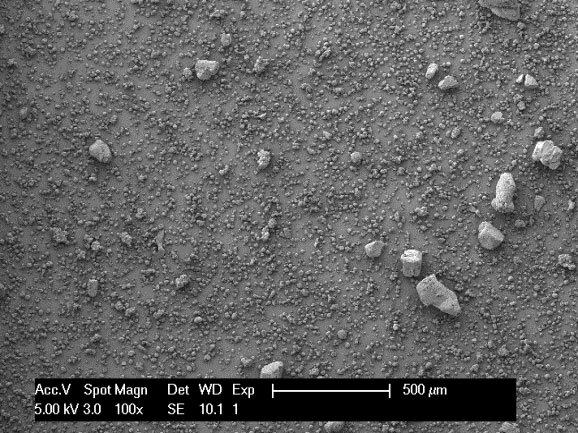 Small impurities of Cu, Si, Sb, S, Na, P and very small impurities of Fe and Mg can be found. Refrigeration will increase shelf life but a warm-up time of 1 hour is then required before use. Sizes are 12mm and 25mm W x 5m L (1/2" and 1" x 5.46 yd) with a core diameter of 76mm (3"). Also available in sheet form: 65 W x 300mm L (2.5" x 11.8"). Please observe that 16084-9 carbon conductive tape, 65mm wide, might be applied for particle collection and analysis in clean rooms or other purposes. Composed of a thin film of strong conductive adhesive approx. 1/2" (12.7mm) dia. on one side and square on the other side. With 0.6% nickel and <0.3% copper content. 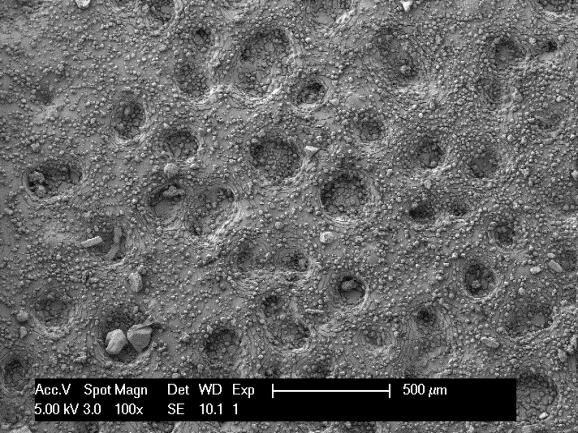 To apply, place "Press" portion of tab on SEM mount surface, lift "Lift Off" tab and peel, slightly rotating tab when lifting. Can be cut to size as desired. These carbon tapes are conductive and may be used conveniently for scanning electron microscopy or EDS applications. Both sides of the tape have a thick conductive adhesive (conductive inner film is 35µm and the adhesive is 45µm on each side for a total of 125µm [5 mils]) with a white liner. 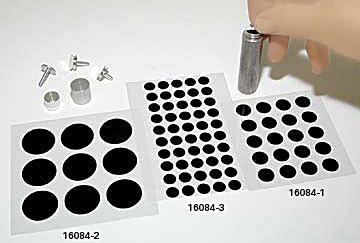 The double adhesive and conductive design permits quick mounting of samples without using liquid or colloidal adhesives. The tape is relatively solid and non-porous and does not absorb small samples. The variety of widths affords efficient application to various specimen mount surface sizes. Thickness is 0.16mm. Available in six widths. Can be used down to -20°C (-4°F) and temperature maximum is 60°C (140°F). Available in 5, 8, 12, 20, 25, and 50mm W x 20m L (0.19, 0.31, 0.47, 0.79, 0.98, and 1.96" x 21.8 yd). Core diameter is 76mm (3"). SEM mounts not included. 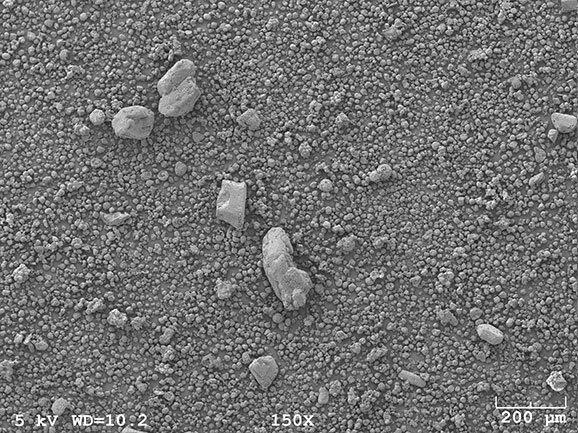 Smooth surface superior to traditional woven carbon tape for SEM and EDS analysis of small fibers and powders. Ideal for automated analysis of particles. 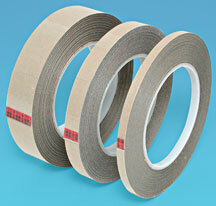 Tape available in 5 widths: 5mm, 8mm, 12mm, 20mm, & 50mm. Also available in 12mm diameter tabs. Based upon four wire (Kelvin probe) resistance measurements made with crossed pieces of Foil/Type 9712 or 9713/Rigid plate construction using a 1.0" x 1.0" square piece of 3M tape Type 9712 or 9713. The rigid metal surface was prepared with a Scotch-Brite pad to roughen the surface and cleaned with isopropyl alcohol. XYZ highly conductive tape comes on a 76mm (3") plastic core and sizes for Type 9712 are 6.35mm, 12.7mm and 25mm W x 32.9m L (1/4", 1/2" and 1" x 36 yd) and for Type 9713 is 12.7mm, 25mm, and 100mm W x 32.9m L (1/2", 1", and 4" x 36 yd), .61m W x 98.6m L (24" x 108 yd), .61m W x 32.9m L (24" x 36 yd). Thickness: 0.127mm (5 mil). The tape adhesive can be removed relatively easily by pulling off, rubbing or by application of packaging tape over the residual adhesive. Adhesive can be dissolved in acetone. 16081-89 3M Type 9713 XYZ Axis Electrically Conductive, Double Sided Tape, 0.61m W x 98.6m L each P.O.R. 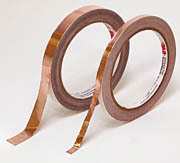 16081-22 3M Type 9713 XYZ Axis Electrically Conductive, Double Sided Tape, 0.61m W x 32.9m L each P.O.R. 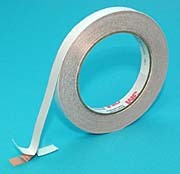 This is a double sided tape with high electrical conductivity. The adhesive is filled with silver coated nickel particles which results in a contact resistance of less than 0.5 ohms through the adhesive layer. Tape has low outgassing and yields excellent bonding of flat and electronic assembly applications. Use at room temperature, no thermal bonding required. Standard plastic core of 76mm (3"). thickness of liner is 0.05mm (2 mil), adhesive 0.05mm (2 mil), total thickness is 0.15mm (6 mil). SEM mounts not included. 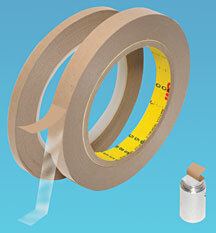 The tape is easily cut to size and may be quickly applied to a specimen mount or other surface. Carbon or metallic coating normally is applied to the sample and mount. An electrical discharge bridge is then completed from sample, through the copper and its conductive glue to the grounded specimen mount. The tape is dead soft copper with a conductive acrylic adhesive. It is supplied on a removable liner for easy handling and cutting. 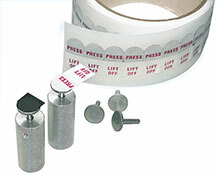 The tape offers excellent conductivity through the foil backing. 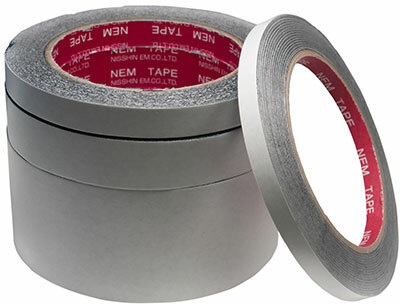 This tape is 6.3mm W x 16.46m L (1/4" x 18 yd) or 12.7mm W x 16.46m L (1/2" x 18 yd) and the core diameter is 76mm (3"). This tape retains the features of the #16072, while enabling the investigator to attach objects directly to the top surface of the tape. The adhesive is conductive. The tape is useful, for example, in attaching insects for SEM investigation. Dimensions are 12.7mm W x 16.4m L (1/2" x 18 yd). Core diameter is 76mm (3"). 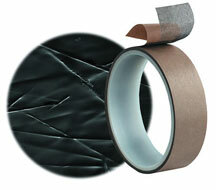 SEM conductive tape, electrically conductive with a clean, smooth background. Nickel is embedded in the adhesive. Overall thickness is .075 mm (3.0 mil), adhesive is 0.040mm (0.0014"). Conductive resistivity is 0.004 ohm/square. Available in 8 and 20mm W x 20m L (.315" and .787" x 21.9 yrd). Core diameter is 76mm (3"). This tape is dead soft conductive aluminum, is easily cut to size and may be quickly applied to a specimen mount or other surface. Carbon or metallic coating normally is applied to the sample and mount. An electrical discharge bridge is then completed from sample through the aluminum and its conductive acrylic adhesive to the grounded specimen mount. Foil Thickness: 0.05 mm (2.0 mil). Total Thickness (foil + adhesive): 0.081mm (3.2 mil). Electrical Resistance through adhesive: 0.010 ohm. Available in: 6.3mm, 12.7mm and 25.4mm W x 16.4m L (1/4", 1/2" and 1" x 18 yrd). Core diameter is 76mm (3"). This highly electrically conductive sheet is suitable for cutting and sizing to samples, with application to SEM and conductive pads. Highly conductive: Resistivity only 0.002 ohm/5x5 square. Little outgassing under vacuum. Will not absorb or penetrate specimens, as liquid adhesives might. 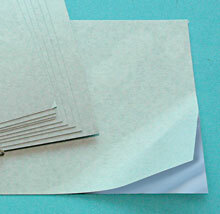 Silver Sheet Size: 50mm W x 120mm L x 0.125mm thick (1.97" x 4.72" x 5 mil).